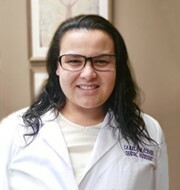 Camila Machado Mariano has 7 years of experience as a general dental assistant and has been with our practice for over 3 months. In her free time, she enjoys writing poetry and composing songs. Camilla is also passionate about community service; indeed, she spends much of her free time helping the homeless with her church. She speaks Portuguese and Spanish.